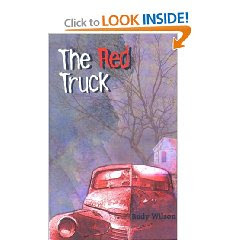 "Whether or not it's meant as a conscious allusion, the title of Rudy Wilson's novel 'The Red Truck' instantly recalls William Carlos Williams's poem ''The Red Wheelbarrow,'' and in doing so, it signals some of the interests shared by this first-time novelist and the poet: a painterly use of color; a reliance on strong, often fragmentary images, and a fascination with syntax and diction. If Mr. Wilson's two characters seem to spend an inordinate amount of time dwelling on their pasts, it's probably because they both suffered severe shocks as children. Billy-Billy nearly suffocated inside an icebox, and Teddianne survived a bad car wreck that killed several of her friends - and those traumas have somehow damaged their capacity for ordinary life. At once preternaturally innocent and sophisticated beyond their years, Teddianne and Billy-Billy live almost entirely within themselves, watching the world, absorbing its information and somehow reconstituting it all in their own imaginations. Though Billy-Billy and Teddianne have grown up miles and miles from each other in small, isolated Southern towns, the lines of their lives inexorably converge - largely, we are led to believe, through the workings of their unconscious minds. Billy-Billy, in fact, comes to believe that he has imagined Teddianne - dreamed her and created her in the image of his alter ego; and Teddianne begins to feel a similar sense of mystical communion with him. In the course of learning the story of Billy-Billy and Teddianne's courtship, the reader is treated to many violent scenes - a lot of it fairly standard-issue Southern gothic stuff but served up with hallucinatory strangeness. Billy-Billy kills a dog (''He had split open too easily, like he was expecting it. All his colors came out''). A man sets his dead wife on fire (''He speared her on a long pole, and held her, burning above his head''). Teddianne's brother falls out of a tree and dies (''floating as he fell with his arms stretched wide and a towel flapping behind him''). And her sister gives birth to a deformed child (''that big, dying baby coming up out of her swamp of fears, all of them coming true''). Mr. Wilson clearly possesses an ear for incantatory prose as well as a gift for delineating the dark shadows cast by ordinary people and things. Indeed, there are moments when we become so entranced by his story that the real world drops away and we find ourselves sharing, momentarily, Billy-Billy and Teddianne's hermetic reality. “When Mama K died, the things in her pale room had a new line of silence around them. I felt smaller and colder in there. I lay on her bed and cried. The tears went into the white cotton bumps on her bedspread.